stand on higher grounds of civic and religious duty." OUR COUNTRY:  ITS POSSIBLE FUTURE AND ITS PRESENT CRISIS. FOR THE UNITED STATES, NEW YORK. PROF. AUSTIN PHELPS, D. D.
representative for the work of Home Missions in Ohio,. or Twenty-five cents in paper. missionaries were found in this State. building up the new communities on Christian foundations? may be gained from the following facts. and receiving into the churches 10,031 members. missionaries is $471 per year. port at least one such Christian worker ? SAVE AMERICA TO SAVE THE WORLD ! free schools ; loyalty to the Constitution and loyalty to the Pope. ism in the United States, especially in the West. P. 46.
despotism. Mormon designs. The remedy. P. 59. II. The liquor power; wealth; organization; aims; methods. Influence in Rocky Mountains and beyond. P. 68. 5. Growing discontent. Modern enginery of destruction. Conditions at the West peculiarly favorable to the growth of Socialism. P. 85.
greater at the West than at the East. P. 1*2. THE ANGLO-SAXON AND THE WORLD'S FUTURE. tion. The responsibility of this generation. P. 159.
who has made it a subject of special study. Says Prof.
Testament. Now in all this you will find nothing new. a moment on the subject. is more universal and extends to the United States. which the dullest and most earthly can understand. larized, and wealth multiplied and centralized. until Christian men come into right relations with it. harsh and hopeless destiny" (" Leading Principles," p.
permit much that the laws of God do not permit. bor would eventually compel its general acceptance. trade. It would mediate between capital and labor. names of employers who wrong their employes. tation to offer some substitute for self-abnegation. "cankered heaps of strange-achieved gold,"
will curse us unto destruction. I came across this interesting text by an American Evangelical Alliance, while presumably Baptist, it was non sectarian in support of American Protestant Sects,including the Mormons if they were reformed. America is a self realization of two forces, those of the liberal enlightenment, Freemasonry and its bourgeois values were perfectly crafted for both colonial and post colonial America. It represents both the left and the right, the anarchist artisan, and the libertarian self employed owner, the artisan and the self employed both could become at anytime, a boss or a worker, until the rise of industrialization immediately before, during and after the Civil War then the artisanal nature of America changed. The Knights of St. Crispin are an excellent example of how the first Capitalist Industrial War, the American Civil War, changed the nature of shoe making. The Knights were founded in the 18th century as a craft guild association and proto union, for shoemakers. At that time in North America, and into the middle of the 19th century, shoe making like many crafts were labour intensive, and involved the whole family. The Knights were an East Coast phenomena in Pennsylvania, Massachusetts,Maine, into the Maritimes, such as New Brunswick and Quebec in Canada. The Knights originated in the UK and their rites and rituals were brought to North America through New Brunswick. Guild Associations are an ancient tradition among artisans and craftsmen. Like a union they determine the piece work wages that they will make as well as the price set for the sale of the finished product. In other words they controlled the means of production directly. In this they were no different then their predecessors in the weaving trades, who were being transformed into mass workers in factories in Europe. Not all trades suffered mass industrialization as early and as totally as the Weavers did. And so various guild associations carried on like the Knights of St. Crispin who originated in the late medieval period. Shoemaking then was a family affair, and in America a family would also be a land owner and a sharer in the commonwealth of the community , such as grazing lands, since land was so freely available more so than in Europe. This allowed the family to produce their own food and shelter, and to practice their craft and trade as well. This required people to be living in towns, villages and cities. if a shoemaker was found to have sold cheap or below standards, fines would be applied as has been the guild tradition for thousands of years. There were weavers in America too at this time but they too like the shoemakers would become extinct crafts as industrialization created mass workers for the war effort. A decline in active members of the Knights of St. Crispin can be seen as steady for a decade prior to the Civil War, by the end of the Civil War the Knights only existed in Quebec and New Brunswick. In the United States they were replaced with mass production of shoes for the metropoles, and for the war. The workers were women and children in these factories, leaving the men to find a different trade, or work elsewhere, or farm. it also required masses of workers, these came from immigration even more so than from the freed slaves of the South. Chicago is a good example of the integration that mass production created, in the ghettos around the packing plants were German, Polish and Ukrainian immigrants who arrived at the same time as many of the Black families coming to join their relatives in Chicago where they heard there were jobs to be had. After the Civil War the abattoirs of Chicago fed the nation and its commodities exchange ruled the farmers of America. shoemakers, and other small craftsmen, as well as immigrants. working in these farm equipment plants. One of those plants would become the focus of the International Workingmen's Association, the Knights of Labour, and members of the Socialist Labour Party. It was the McCormick Works and a year after the publication of this pamphlet, and the year was 1886, the fight was for the eight hour day, and the resulting strike and protest lead the famous Haymarket Riot. the need for another Home Missionary Movement to combat Catholicism brought in by the Immigrants from Europe. Conversion for heathen and papist was the cry. As it had been in 1826.
to confirm America as a Protestant Nation, the first ever 'pure Aryan' Protestant nation. Unlike Europe where all nations were Catholic and then converted to Protestantism. generic at that, anyone could call themselves Baptist, even Presbyterians. The Anabaptists that remained were the collectivist cults, like Mennonites, Hutterites, Amish, Dukhbour. cultic beliefs which meant persecution. New York State, was home to many of the early alternative sects, cults of Christianity and of Spiritualists and Soothsayers, Theosophists to Freemasons, Odd Fellows and other fraternal orders and to Nativist Sects. The communistic protestants the Shakers were there as was the town of Lilydale full of Spiritualist communing with dead It was in this spiritual milieu that Joseph Smith traveled in before his revelation and creation of the Mormon Church, with rites and rituals he 'borrowed' from Freemasonry. End Times, Apocalyptic cults believing in the end of the world. In America these cults became so called Christian sects like the Seventh Day Adventists and the Jehovah Witness movement. While they originate in Protestantism, they are not Christian, they are cultic interpretations of the bible to prove their predictions. It is still with us today and it calls itself the Moral Majority. 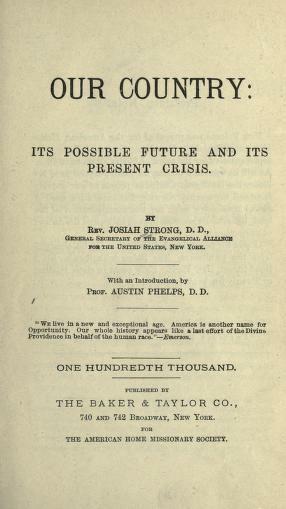 Ironically the author of this propaganda pamphlet would be considered a socialist heretic to today's Moral Majority and other End Times types of Evangelists. They would not even recognize his Aryan Anglo Saxon as being the same as their Nativist White Nationalism. There are similarities in this work with today's White Nationalism, it reference to Aryan and Anglo Saxonism as Aryan. Aryan as Christian, and that means White people. There are no Negros in this book and there are no Red Men, not even the white fraternity by that name. So along with missing people of Afro American descent or First Nations, also the with the immigrant, they must be the right kind of White People, not Catholic, not socialist or union trouble makers, nor rampant capitalists. Our author would be astonished to learn that today his American counterpart scoffs at the idea socialism in America. And yet here it is, of course like today's Aryan Nationalist Nativist it is not natural or homegrown, it is again blamed on the immigrant, whether from Canada or Europe, just like Catholicism, is not considered native to America, despite the founding of North America by the French and Jesuits. Again like populist politicians who decry the rich and powerful, like Trump or the Kingfisher, even Teddy Roosevelt, there belief is in Aryan idealism, just as the author equates as did Roosevelt, Aryanism with Americanism with Manliness, Strength, and Moral Purity. Of course such a being, a person or a nation then is entitled to rule over the world. But, as nations grow rich,they are prone to become self-indulgent, effeminate,immoral. The physical nature becomes less robust, the intellectual nature less vigorous, the moral less pure. The pampered civilizations of old had to be re-invigorated, from time to time, with fresh infusions of barbaric blood a remedy no longer available. If we cannot find in Christianity a remedy or preventive, ourChristian civilization and the world itself is a failure;and our rapidly increasing wealth, like the "cankered heaps of strange-achieved gold," will curse us unto destruction. Teddy Roosevelt could have said this so could Steve Bannon. In fact you probably have read the same statements in any number of right wing commentaries published by such intellectual light weight pundits as Bannon and ilk. Finally lets discuss the most obvious statement, the idea of Crisis. What crisis, the author in the end attests it is one of Aryan or Christian civilization the two being equivalent. A multicultural America is the bugaboo of the assimilationist, scratch the surface and you find a nativist Aryan. The real crisis as it is today, is the changing nature of bourgeois capitalist society. As it was then it is today, society is going through major changes at all levels, including the transformation of the means of production into robotics, cybernetics and AI. It means capitalism itself is transforming through technological change, not just to a gig economy but eventually a return to artisanal production at home using new technologies like 3D printing. As well the collapsing nature of capitalism as well as its positivist transformations, it remains in permanent crisis, why in order to sell weapons, oil, etc. Since the turn of last century the Barbarism of capitalism that we first saw in the American Civil War created the First and Second World Wars, interrupted by two revolutions the Russian and Spanish. post war nationalism and anti-colonialism, something you would have thought America would champion, but this was the era of the Red Scare and the Cold War. that came out at the same time in Seventies. Kidron has been proven right by the continuous sale of weapons world wide, and it is these weapons that are the source of other crimes, in particular drug running, in order to pay for them. America is the worlds largest gun runner, if its not creating wars, invasions it is selling weapons to those in conflict. Its most recent sale to a client state, was over $100 million dollars to Saudi Arabia, for them to also gun run and to use against the Shia whom they are conducting an ethnic cleansing war in Yemen. Wars in Iraq, Libya, Syria, Yemen, all caused by the USA in its so called war on Terror, which is just another name for gun running. Today we face once again the choice Socialism for survival and sustainability, vs Barbarism. The Barbarians are Aryan Nationalist White Nationalists America, Brit, Russian, French,etc etc Nationalists. Nationalism is Fascism.